By Fiona Gordon, Biodiversity Ranger DOC. The Wairua River Government Purpose Wildlife Management Reserve (or Wairua River Reserve for short) is one of two main wetland areas remaining in the Hikurangi catchment, feeding into the northern end of the Kaipara Harbour. 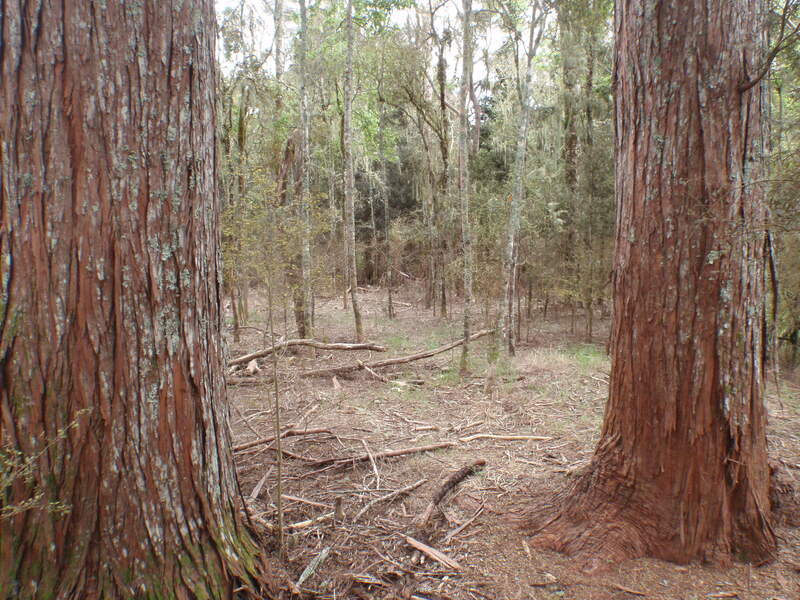 It is home to a number of threatened plants including the nationally vulnerable heart-leaved kohuhu, and the Hikurangi swamp hebe – which, up until recently, had only been found in this catchment. A very special plant indeed! The threatened Hikurangi swamp hebe. Weeds like the chinese privet and wandering willie are a big problem for these threatened plants; out-competing them for light, and preventing their seeds from germinating by forming dense carpets on the forest floor. The weeds threaten to dominate the reserve – changing the wetland structure and limiting the suitable habitat for our awesome native wetland creatures like the black mudfish and the Australasian bittern/matuku. Last month, we tackled the woody weeds as part of a wider Living Water project (in partnership with Fonterra) to control transformer weeds in what is one of the best remaining wetlands in the Hikurangi catchment. 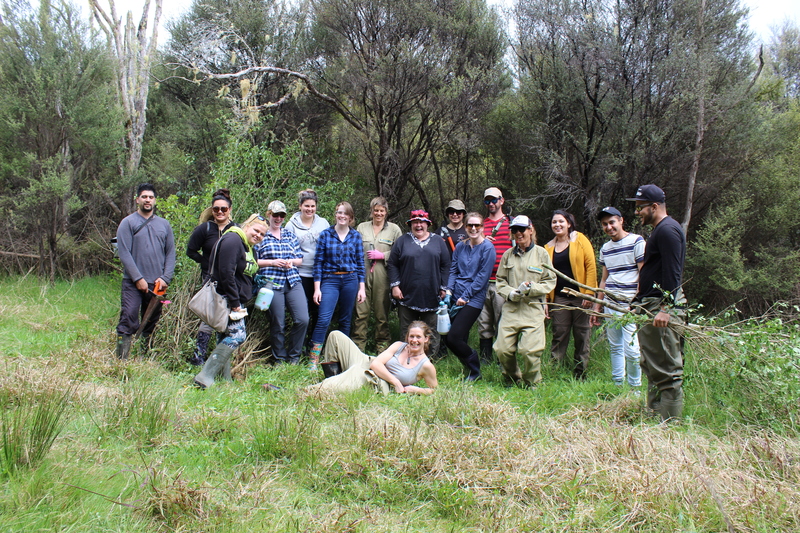 On October 13th, armed with loppers, saws and secateurs, 14 students from NorthTec’s Conservation and Environmental Management program and their tutor, Tanya Cook, headed out to the reserve to help give our threatened plants a fighting chance. The work is part of an annual event in partial fulfillment of the student’s pest management studies. All day long, the students toiled away, with the help of our DOC rangers (Marie Jordan, Miriam Ritchie, and myself) sawing and pasting, pulling and dragging, to clear the forest understory of privet. The NorthTec team after a successful day weeding. The following week, reinforcements from the DOC Whangarei Volunteer Wednesday program came out to continue the charge. Nine hardy volunteers joined the island weed team (Dan Cowan, Deane Williams, and Piper Douglas), Ranger Fiona Watson and myself to continue to tame the privet jungle. After hours of hard weeding the teams made a sizable impact, transforming what was a dense privet grove into a open forest of twiggy divaricating natives (finding a number of heart-leaved kohuhu in the process!). The area cleared by the Volunteer Wednesday team last year – free from privet and wandering willie. Once the nasty privet had been removed, we were able to spray the wandering willie, giving our special plants the chance to germinate and grow. The site will be sprayed again in March to catch any regrowth before it becomes a problem again. It ended in an amazing transformation! It’s always such a lift to have the help and support of the volunteers and NorthTec students. It’s a great opportunity for the teams to experience some of the special wetland systems right on our doorsteps, and awesome creatures they contain. It gives us a real boost with our progress at this site, which is great for morale! It’s amazing how much you can achieve with many hands. Living Water is a 10-year partnership between Fonterra and DOC who are working with dairy farmers, iwi/hapu, conservation groups, schools and other agencies to improve the health of five key catchments in significant dairying regions throughout the country. The initiative is about working to improve water quality and the sustainability, abundance and variety of indigenous biodiversity; native wildlife and plants in the five catchments. Hundreds of invasive weeds are smothering our native forests, wetlands and coastal areas, harming our wildlife and transforming our natural landscapes. We invite you to join with DOC and Weedbusters to fight this war on weeds. Great work Fiona and your team – and so good to see a lively bunch or two of young people helping with this work! Good on you all. Weeds are like rust – they never seem to sleep! Hopefully this work can be repeated all over New Zealand. Fiona you are a natural born leader! Good on ya my friend. Great pic.